Now your bill is easier to read and to understand. Click on the image for an overview of some of the changes in the way billing information is now displayed. 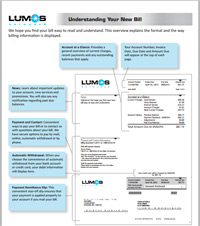 Lumos Networks customers will see a property tax pass-through on their monthly recurring charges added to their monthly billing statement (or a maximum of $1,000). In an effort to enhance the performance and provide the unequaled customer experience Lumos customers have come to expect, Lumos has invested more than $200 million to build, upgrade and enhance current Lumos FTTC and Enterprise capabilities. The pass-through will allow for the recovery of a portion of the new and existing property taxes imposed by state and local jurisdictions on these investments and on existing facilities owned and maintained by Lumos Networks, while enabling Lumos Networks to continue such investments in an ongoing effort to bring a world-class fiber network to our customers. Media inquiries regarding the pass-through are to be directed to James Nester, Vice President Marketing & Public Affairs.